Mentor has today (February 21) announced the forthcoming release of an enterprise-class embedded Linux package based on the Debian open-source OS. Mentor Embedded Linux (MEL) will fill what the company sees as a gap in the market (Figure 1). Standard options lack the performance needed for many commercial applications. Existing enterprise-class options lack the necessary degree of configurability. Mentor sees those enterprise users looking for something more robust and more scaleable. “As more engineering organizations recognize the value of open source solutions, next generation embedded systems are also redefining software development needs,” said Chris Rommel, executive vice president of VDC Research. The multicore-enabled suite was originally developed for internal use during the development of automation products at Mentor’s parent company, Siemens. At its core is a range of pre-built binary packages covering general features and parameters. The company argues that these will allow customers to install MEL quickly and achieve more efficient deployment and consistency across work by multiple developers. Further support is provided by a tool chain and stable kernel. MEL is cloud-enabled and supports technologies such as XMPP, MQTT, AMQP, and CoAP, and has RESTful API support. 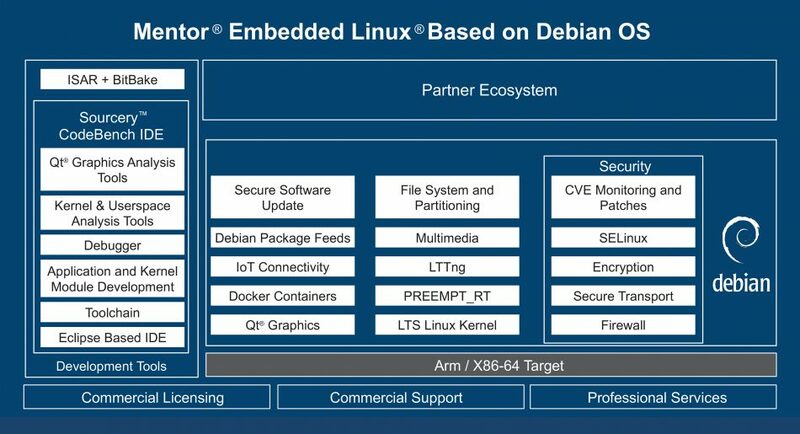 “By combining the capabilities of an embedded Linux distribution with those from the Debian binary desktop Linux distribution, today’s developers – many of whom have honed their skills in the Linux desktop development – can easily extend those same skills into fully featured embedded systems,“ said Simon George, director of system software and SoC Solution Marketing, Xilinx. A version of MEL based on Yocto is also being made available. MEL is primarily aimed at IoT and smart device projects in the medical, industrial, aerospace and defense markets. It will ship in Q2, and is being demonstrated next week at EmbeddedWorld in Nuremberg, Germany (February 25-27).